NASA?s shuttle Endeavour is on track for a planned weekendlaunch toward the International Space Station, mission managers said Tuesday. Endeavour is slated to blastoff at 7:17 a.m. EDT (1117 GMT) Saturday morning from NASA's Kennedy SpaceCenter in Cape Canaveral, Fla., and preparations are going smoothly, launch testdirector Charlie Blackwell-Thompson told reporters in a mission briefing today. "All of our systems are in great shape," she said. "I have no issues to report. The STS-127 flight crew, Endeavour, and thelaunch team are all ready to proceed." The shuttle is slated for a 16-dayconstruction flight to the InternationalSpace Station to deliver the last segment of the Japanese Kibo laboratory,a porch-like experiment platform that will be attached to the lab?s outer hull.Five spacewalks are planned to install the new porch, as well as new solararray batteries and spare parts. Endeavour's seven-membercrew, led by veteran astronaut Mark Polansky, arrived at the shuttle?sseaside launch site late Monday at 11:53 p.m. EDT (0353 GMT). The officiallaunch countdown is set to begin tomorrow at 9:00 a.m. EDT (1300 GMT). "We?re absolutely thrilled to be down here inpreparation for Saturday's launch of Endeavour," Polansky said afterlanding in Florida last night.? So far, even the weather looks to cooperate for thisweekend's morning launch. "The weather forecast for our launch day is 80 percentgo," Blackwell-Thompson said. "Certainly it?s a very promisingforecast." 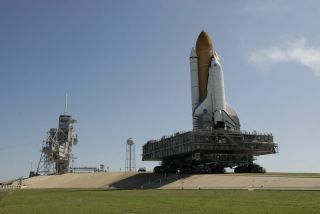 If Endeavour is unable to launch Saturday, NASA can tryagain June 14 or June 15. Then the shuttle program must stand down to allow theliftoff of the Lunar Reconnaissance Orbiter (LRO) and the Lunar CraterObservation and Sensing Satellite (LCROSS) to proceed as planned June 17. If the shuttle is unable to launch in June, NASA would haveto wait until mid July, when sun angles at the space station are favorable, totry again. Endeavour?s STS-127 mission is NASA?s third shuttle flight of theyear and comes on the heels of a successful repair mission to the Hubble SpaceTelescope last month. SPACE.com will provide complete coverage of Endeavour'sSTS-127 mission to the International Space Station with Staff Writer ClaraMoskowitz and Senior Editor Tariq Malik in New York. Click here for mission updates anda link to NASA TV.